Professor Cheng Man Ching was a very remarkable man. He maintained the old Chinese cultural tradition whilst China was changing under the influence of the western world, Japanese warfare and communism. Cheng Man Ching still wore his traditional clothes in Taipei and even in New York City. “Oh, this is a very old prescription, nobody is using this anymore”. Nevertheless Cheng Man Ching was very successful in his traditional medical approach. 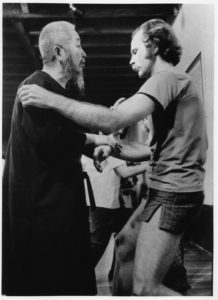 In Tai Chi Chuan he became so skillful that he was invited to teach at three military academies in China, where he developed his Yang style short form. Eventually his Tai Chi Chuan spread out over the whole world except for mainland China. 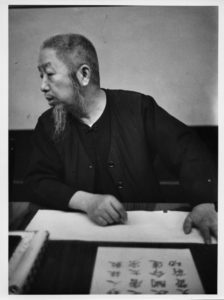 Calligraphy was taught by him in a very traditional way indeed: Hours of trying to draw straight lines on paper, then the same with drawing circles. 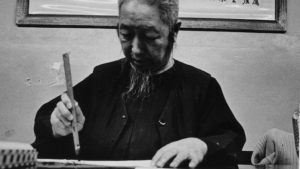 He was isolated in the art of poetry, especially in New York since only a few people could speak Chinese and writing poetry the old fashioned Chinese way is difficult. “I was with Cheng Man Ching in Taipei in 1971 and came into his room and talked to him. Cheng Man Ching was busy with a brush and it looked as if he was cleaning the brush on a piece of paper. I kept on talking to him until he showed me the painting which was a beautiful flower”. Ed apologised: ” I am so sorry that I kept on talking while you were painting”, Cheng Man Ching answered: “It’s alright, since the painting is already in my head.” Ed realised that Cheng Man Ching did all his painting this way – no corrections, no hesitation, it just flowed out of his brush. Cheng Man Ching had one-man shows of his paintings in Paris, New York and Taipei. Living in his traditional way he managed to survive in such a modern city as New York City. He even choose to teach an open class where all students could come, including Western students. The Chinese community in New York tried to keep Cheng Man Ching to themselves and closed the door of the training hall in Chinatown but Cheng Man Ching could not accept this restriction and opened a school on Bowery street. Some people told me that Cheng Man Ching was a pretty good Chinese chess player and he could also ride a horse. Katy, his daughter, mentioned that once there was a very wild horse that nobody could ride. Her father however, through talking to the horse, was able to tame the horse and ride it! It looks like Cheng Man Ching was an early horse whisperer, subduing the animal by softness instead of force. There is also a story of a monkey who suddenly appeared in the courtyard of their house in Taipei and everybody was afraid of the animal. Cheng Man Ching went to the monkey and after some time they were eating peanuts together and Cheng Man Ching even let it drink a little wine. Robert Smith tells a story in which Cheng Man Ching meets a tiger on a narrow path in the mountains in China. Cheng Man Ching got a little out of the way by leaning backwards over the mountain ridge and letting the tiger pass. Maybe we should say that Cheng Man Ching mastered 7 arts or maybe even 8 for he was very well versed in Chinese philosophy especially Taoism, Confucianism and the I Ging. In the West Cheng Man Ching is most known for his expertise in Tai Chi Chuan. He learned the art from Yang Cheng Fu, one of the most famous teachers in China within the Yang style. In the exercise called pushing hands it becomes evident to what extent one understands the internal principles of tai chi chuan. Cheng Man Ching was able to effortlessly push his opponents far away. It is striking that many of his students reported that they could not feel how they were being pushed. This is called softness in Tai Chi Chuan. Cheng Man Ching would use the wall as a stopping means in pushing hands over one or two metres distance. Students talk about being launched in the air, bumping into the wall and then landing on their feet. The push felt like nothing, or cotton, or like a cloud. Other people talked about being completely cornered with nowhere to go until launched into the air. Cheng Man Ching could do these things also in a real fight. He was considered by many to be the best internal martial artist in Taiwan. Wong Chia Man, who is a master of northern Chinese martial arts and a real fighter (known from his fight with Bruce Lee), said to Peter Ralston before Peter became a world champion free fighter, that he should always learn from the best. Wong claimed to be the best in what he was doing, but recommended to Peter that he should learn Tai Chi Chuan from Cheng Man Ching, since he considered him to be the best in Tai Chi Chuan. Students saw many black belts in different martial arts being easily defeated by Cheng Man Ching. Although all these fights were friendly encounters, it is remarkable that a man in his seventies was able to push them. I saw one challenge on video, a student said to Cheng Man Ching, “we are always so friendly to each other in pushing hands but what happens if we start hitting?” Cheng Man Ching invited the student to hit him. The student gave his all but Cheng Man Ching took the punches on his body with a smile and then pushed the student while he was hitting him. William CC Chen also has this ability to take punches. I have punched him several times with and without boxing gloves and I never had the feeling that I could damage him. My last encounter was when he was sixty years old. I punched him about ten times in his face with boxing gloves with William saying: “no not right, do it again, do it again”. Ben Lo is known for winning exchanging chops to the forearm. Another story is of a student who hid behind a door and attacked Cheng Man Ching from behind. He was pushed the instant he attacked. Cheng Man Ching became upset with the student because in a situation like that, the natural response of the returning force could have badly damaged this student. The student was sent away from the school. This story illustrates the level Cheng Man Ching attained in Tai Chi Chuan. The returning force is always present. Techniques are spontaneous, not like “if you do that then I will do this”. The response is there without thinking. Cheng Man Ching loved to do swordplay. In films about Cheng Man Ching you can see him smile and laugh while moving around lively doing a kind of pushing hands with the sword. In my interviews with direct students of Cheng Man Ching I have heard different accounts of how it felt to do swordplay with Cheng Man Ching. Some talked about a very light touch from which there was no escape, others reported a very heavy sword but again no escape. In some way his sword was always coming towards you, there was nowhere to go but backwards. Disengaging his sword to attack him was impossible because his sword would have caught you before you could attack. The highest level of swordplay according to Cheng Man Ching was to cut somebody while moving defensively. 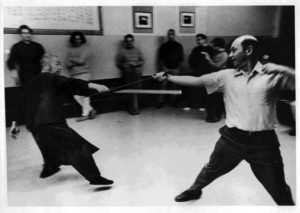 Ken van Sickle told me that most swords in the training hall had been broken (and glued back together) at their weakest point at the guard because Cheng Man Ching loved to disarm his opponent and the sword would break on impact with the ground. To be as relaxed as possible was the most important point. Becoming aware of the air around you is a sign of relaxation. Swimming in air and feeling the resistance of the air as if you are in water is a recurring phrase in the notes that I have seen, taken in his classes. To move from the center. Cheng Man Ching had a dream in which it became clear to him that pushing hands had nothing to do with hands and this dream made a lot of difference in his ability to push people. I did read his advice to push from the middle spine between the shoulder blades. To have beautiful ladies’ hands. This means no bending in the wrist and the fingers almost straight but still bent and as relaxed as possible. Why Cheng Man Ching stressed this point so much has never been completely clear to me. Of course there is the balance between tension and relaxation or “bentness seeking straightness” as Robert Smith puts it. Maybe beautiful lady’s hands is not only about the hands but a feeling through the whole body so we might speak about aligning the whole body to a beautiful lady’s hand. Other people suggest that a push occurs within the space provided by structure of maintaining beautiful lady’s hand, which isn’t much so the push has to come from the body. Cheng Man Ching was asked why his teacher Yang Cheng Fu had bent wrists in photographs. His answer was that Yang Cheng Fu could bend his wrists so much that the back of his hand could almost touch his forearm allowing his teacher to be relaxed with his wrists bent at ninety degrees. To have a straight back. Aligning the spine with gravity makes the body more relaxed and gives freedom to move in any direction. 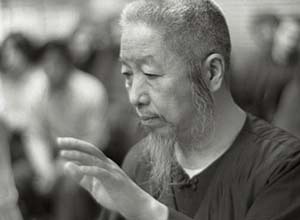 In pushing hands you can see Cheng Man Ching bending forwards and backwards quite often so having a straight back is not a rigid dogma but a principle to align with. Food for thought: could there be a straight back in bending? To differentiate between yin and yang is the principle that is the most difficult to understand. This principle is about distinguishing where the lightness and heaviness is in the body at any moment. It not only has to do with weight distribution between the feet but also within individual body parts themselves. For example, when sinking the elbow, one should distinguish which part of the elbow is heavy and which part is light. The most important distinction however is the relationship between oneself and one’s opponent. Do you meet force (heaviness) with force or can you differentiate between the yin and yang forces within yourself and within the relationship with another human being? Understanding this distinction creates the possibility for neutralising or returning the opponent’s force back up from the ground. Cheng Man Ching has been a very important person in the development of traditional Chinese arts in the West and especially for spreading Tai Chi Chuan. To his inner students he was far more then just a Tai Chi Chuan teacher. He improved their constitutional health deeply with herbal prescribtions. With his wisdom and insight in life he guided his students whenever they needed him. Cheng Man Ching, master of five excellences, was indeed a remarkable man.